Bewitching hour is upon us, or it was upon me when I conjured up today’s outfit from my wardrobe. As you may have seen in my latest haul video (here), I’ve accumulated a fair few affordable pieces at the moment, and decided to bring them together and style up a summer outfit from my new stash. I have always struggled to find summer outfits that feel like me, and this entirely black ensemble, does. 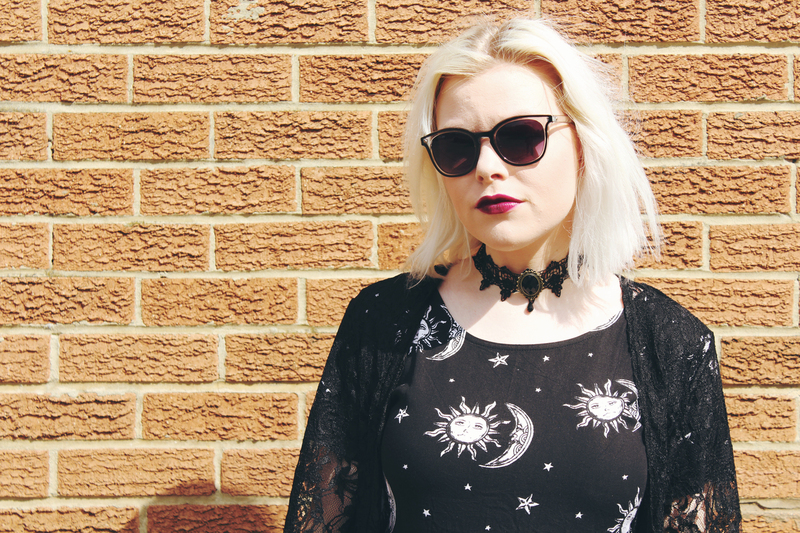 If you’re a fan of embracing the darker side of your wardrobe, summer or no, then this one is definitely for you. 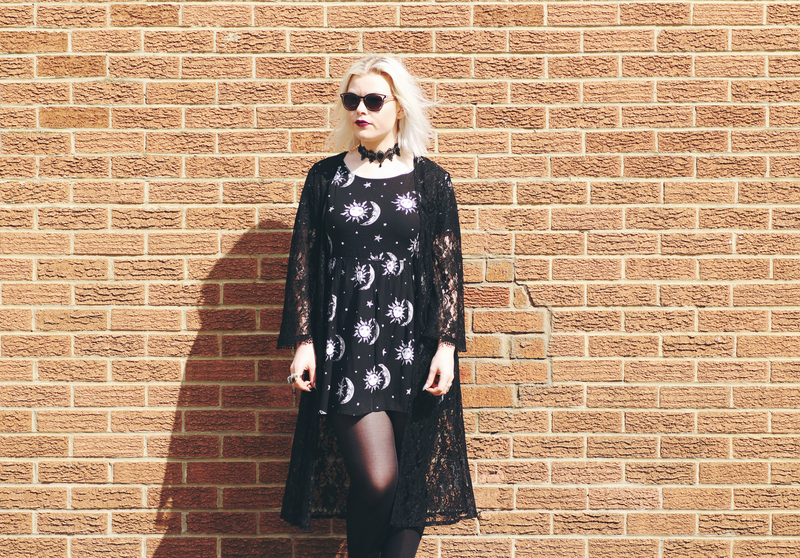 I started out with this Motel dress which I’ve always wanted, that sun and moon print is just to die for. They currently have this online at Topshop (here)– which is where I found mine, and I actually bought the Topshop voucher I paid with through a great new app that I wanted to let you guys in on. If you often accumulate vouchers you never spend, and would rather have the cash, Zeek is a great place for you to rid yourself of unwanted vouchers. Like Depop, you sell and buy from others in a straightforward manner, but this time we’re just talking vouchers. Buyers can get fantastic deals too by buying vouchers for less than they’re worth, i.e buying a £60 Topshop voucher for £50. If you’re going to spend that money anyway, you may aswell get a little extra right? 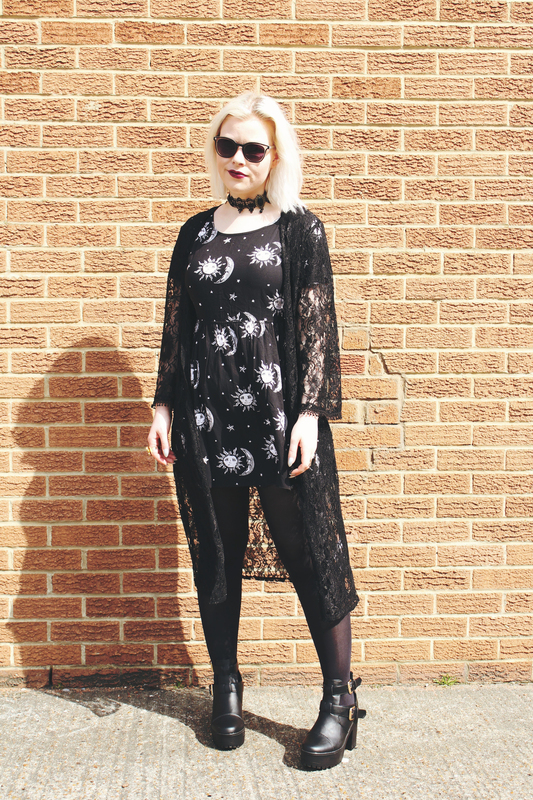 To keep the look summery and so I didn’t overheat, I just threw on this gothic style lace kimono from Forever 21. 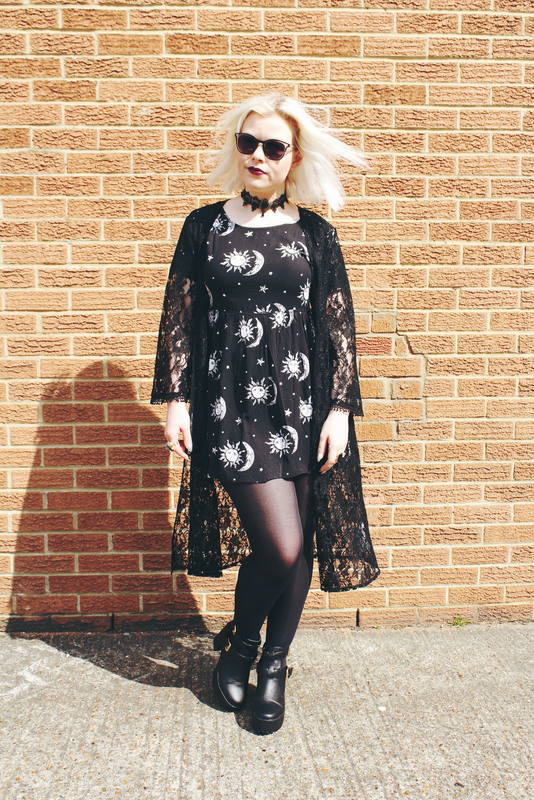 This adds the perfect texture to this monochrome outfit, and instantly goths up any cutesy summer dresses you might think are too prim for you. I can’t wait to throw this over tonnes of floral dresses and ankle boots for a grungier summer look. 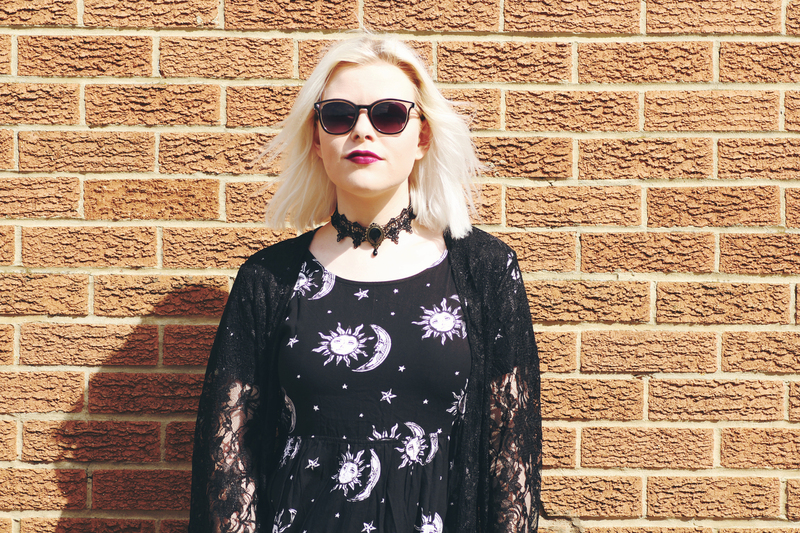 Accenting the lace kimono is a badass choker from Boohoo, which adds massively to the outfit, but will only set you back £5 in their current sale (here). On my feet I have a pair of staple black boots- with cut outs, which makes them breathable for summer too. These were very kindly sent to me by Blue Inc and they’re genuinely so comfortable, yet give me that little bit of height so I don’t feel so small! If you’re on the hunt for some affordable summer footwear that you can wear on the daily, check out the Blue Inc boots here for just £24.99!